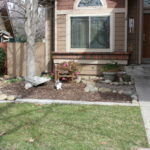 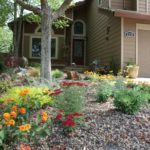 I love transforming a yard…look at the before photos. 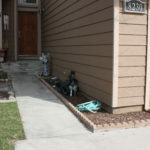 Imagine coming home each day and walking the narrow concrete path and stepping up the dull concrete steps. 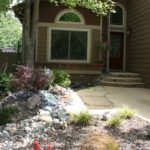 And then look at the after photos…the concrete walk is gone and a flagstone path that is gently curving now takes you to the door. 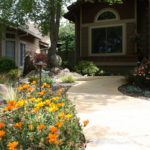 The steps are of flagstone, there is a small courtyard area and water feature, and now the entry to your home is peaceful, colorful, and a joy to be in!